Since the dawn of time children have been driving their parents crazy, and once kids reach the teen years, they are driving their parents' cars as well. So naturally parents want to know, "What's going to save our sanity once junior starts to drive?" We quip: A one-seater ... but OK, we have some tips, too. The stats about teen drivers aren't encouraging. Sixteen-year-olds get into accidents six times more than drivers between the ages of 30 and 59, according to Edmunds. No wonder insurance premiums for this age group are so high. Mike Poller a father in Florida warns, "I am now spending about $10K per year on auto insurance for me, my wife and two daughters." Finding the best - and most affordable insurance coverage for your new driver is a lot like searching for a mortgage -- there are deals to be had out there, sure, but finding them takes a lot of diligent research. Start off by using an online comparison tool, like this one here at Insurance.com. After you've input the pertinent information, this tool will shop around for the best deal for you. Of course, any online comparison tool is only as good as the companies it searches. We always recommend contacting insurance companies directly for the best quotes. It requires more work, but it often pays off. When PR professional and mother of three Lisa Singelyn shopped around to insure her 16-year-old son, she discovered most of the major insurance companies offer a discounted rate for an "Occasional Driver" which is just what it sounds like -- get a less expensive rate for adding a driver who doesn't use the car very often. When she asked about the discount, her insurance company told her it wasn't offered, but when her husband threatened to pull their policies and go elsewhere, the company offered them the occasional driver discount. Savings for using this category? Approximately $500 annually. As the Singelyn's experience illustrates, speaking directly with a company may insure, pun totally intentional, you get a better quote. According to the site InsureUonline.org age-old recommendations such as buying an older model car for your teen to drive, and keeping them in something sensible, instead of a Maserati, still hold true. Not only will a big old clunker for your teen help keep your insurance premiums down, it will give you some piece of mind as well. Popular opinion is to get at least three quotes and compare, but one dad told us, " I just got back from dropping off a $1,200 check for my youngest daughter's first six months of auto insurance. Not much shopping involved, my insurance company offers increasing multi-car discounts ... I already have three cars on my policy, so I figure it is probably not worth the time/effort to shop this... " We disagree. Don't make assumptions about whether it's worth it or not for you to explore other companies. Compared with the money you may potentially save, spending a few minutes calling around may make sense. It also may make cents. Got a Green Teen? Maybe your state offers its own version of paying by the mile, which means you only pay for the miles you actually drive, drive fewer miles, pay less insurance. Right now there is a pilot program gaining popularity in Texas, MileMeter.com, offering discounted insurance based upon miles actually driven. Since teens drive fewer miles on average, this might be an option to consider as you hunt around for rates and plans. Parents can also ask about an "accident forgiveness clause." An accident forgiveness clause waives any premium increase for one minor accident. Think of it as a gift, because realistically, and statistically speaking, it's not a matter of if your teen gets into a fender bender, but when they get into a fender bender. Why not look for the company which gives you a break when your new driver forgets to hit the brake. Insurance costs money, so decide if your teen will be contributing to the cost. This contribution can be in-kind, such as keeping grades up, no speeding or parking tickets and adhering to curfew. Teens who have paid employment, can certainly contribute toward the cost of insurance and it's up to parents to decide how much of a percentage of it they expect their teen to fork over. As parents we make it clear to our kids money doesn't just grow on trees, but what about car insurance? 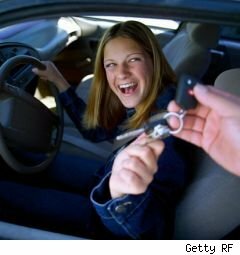 Parents aren't Insurance Fairies, sprinkling collision and liability coverage over the vehicles before our teens get behind the wheel of the family truckster, it is our responsibility to make sure our offspring understand the personal, and financial, responsibilities accompanying their incredible new-found freedom. And if we really want that message to sink in? Do as Lisa Singelyn did, update your Facebook status with something along the lines of," WARNING! My 16-year-old son is now driving on the open road!"